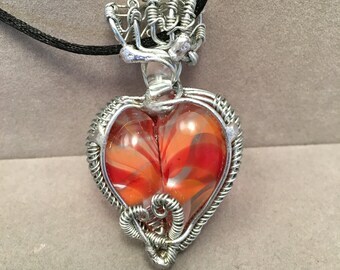 This blown glass heart pendant would make a lovely mother's day, graduation or wedding gift and comes in a Aspen Hot Glass gift box. 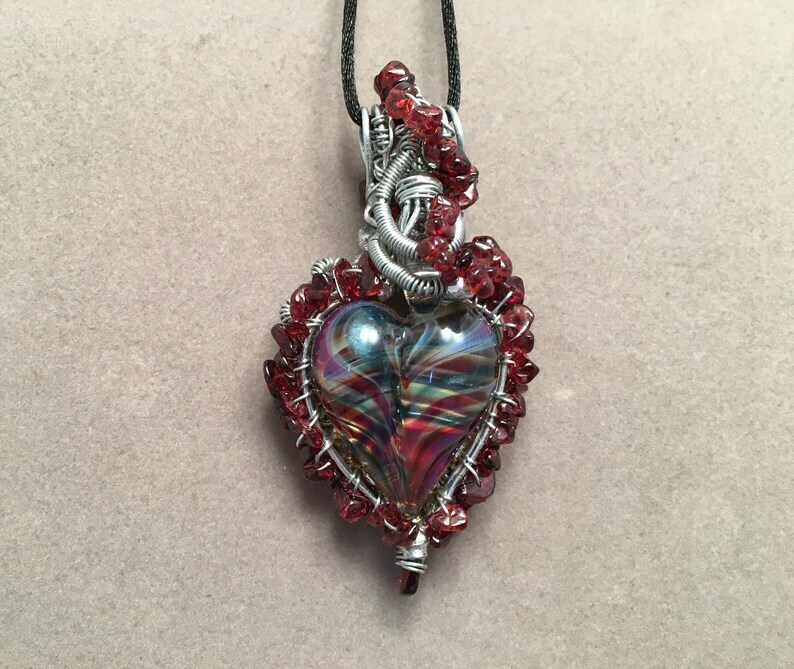 Bill blew the glass heart in this lovely pendant using boro glass in the colors of red and a light hint of sparkle blue. 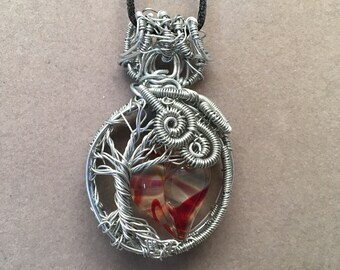 I wire wrapped it using silver wire adding garnet gemstone nuggets into the wire work. 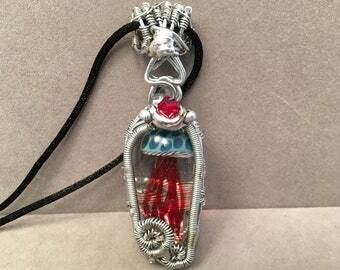 The pendant measures about 3.33” long, 1.65” Wide and 0.65” Thick. The satin cord is 27” long with a lampwork slider bead for adjustment. Bill has been blowing glass since 1993. In 2002 Rae left the corporate world to be with Bill and pursue her artistic adventure blowing glass and so much more. 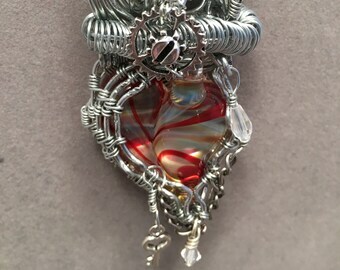 Since 2016 Rae has been incorporating metal working, steampunk, dragons and other fantasy themes into the glass art. Together they live on a small farm that includes orchards, an extensive garden with a green house, Steampunk shop, Torch shop for torch work glass blowing, Bills Man Cave equipped with an electronics wing and the Brew house, along with the Sage Cottage Observatory for astrophotography and the vacation getaway Sage Cottage 406 itself where guests can join the journey in comfort and quiet. The location has wide open views overlooking the Bitterroot Valley of Montana, where together they spread love and harmony, sharing this fantastic journey called life. 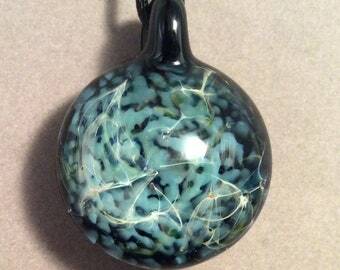 plus the Aspen Hot Glass website. 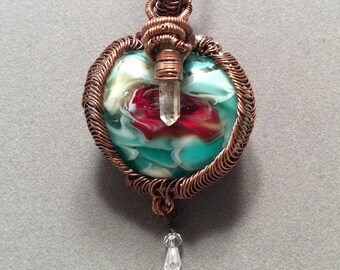 This is my first blown glass pendent for myself and I'm in love. Will definitely buy again from this shop if I see something that catches my eye. We accept direct checkout using the debit or credit card of your choice. We also accept Pay Pal so whatever is most convenient for you we appreciate your business. We offer a 7-day Return policy on stock items. If you are not satisfied please contact us within 7 days of receiving your items and you may return them for reimbursement or replacement. You will need to pay the shipping back, after the items are safely returned we will issue a refund or replacement. Our drawer pulls / cabinet knobs are custom made one at a time after the order is placed. We cannot accept returns on orders with more than 2 knobs. If you would like to order a sample before production quantities are placed please contact us and we would be happy work with you. We calculate the cost of shipping for each item carefully and work to keep our shipping cost down to make both parties happy. Shipping cost differs depending on the weight and package size. We use USPS for most items but if we can ship larger items more cost effective we will. We are happy to ship to our international friends. 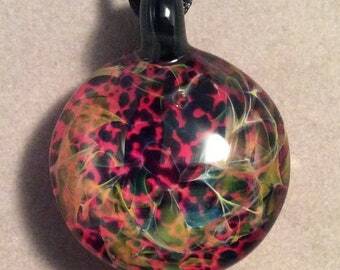 It is fun to see our blown glass art shared around the world. We do fill out customers forms and declare the value of each item. I am sorry if this is an inconvenience but we live in a small town and everyone at the post office knows us and we have to be good kids.